Habit: Guapira obtusata grows as a large shrub to medium size tree up to 8 m in height and 30 cm in diameter. The leaves are arranged oppositely, to 15 cm in length and 7 cm in width. The leaf margin is entire and the apex emarginate. The entire leaves are often revolute. The actinomorphic flowers are arranged in panicles. Guapira obtusata is dioecious and the flowers have an undifferentiated perianth consisted of a single whorl that is yellowish green with red hairs. Staminate flowers have an elongate fused perianth that is 0.5 cm long with 6-8 stamens and a non-functional ovary. Carpellate flowers have a fused perianth that is 0.25 cm long with a superior ovary with a single locule and non-functional stamens apprised to the ovary wall. The fruit is a drupe that turns bright red at maturity and develops ribs. Habitat: Guapira obtusata grows in Dry Broadleaf Evergreen Formations-Forests/Shrubalnds (coppice) on both lime stone and sand substrates. Medicinal/Cultural/Economic usage: Guapira obtusata has no known medicinal usage in the Bahamas. 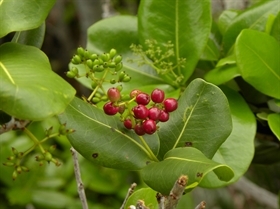 Guapira obtusata is a common species through out the islands and produces a large amount of fleshy fruits that support a diverse avian population.